I am retired and live in the Appalachian Mountains of Pennsylvania. I built my first mountain dulcimer in 1974. I continue to build mountain dulcimers, hammered dulcimers and do repair work on them as well as guitars and banjos. I enjoy old time music, bluegrass, and folk music from before and after the folk scare of the 1950s and 1960s. "Welcome to FOTMD, Rednancy. It is good to have you aboard. Ken "The dulcimer sings a sweet song."" "Welcome to FOTMD, Harmonicaman68. It is good to have you aboard. Ken "The dulcimer sings a sweet song."" "Welcome to FOTMD, Unga. It is good to have you aboard. Ken "The dulcimer sings a sweet song."" "Welcome to FOTMD, R2pipes. It is good to have you aboard. 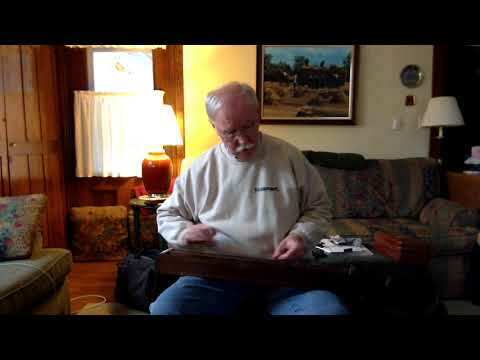 Ken "The dulcimer sings a sweet song."" "Welcome to FOTMD, DeeLee. It is good to have you aboard. Ken "The dulcimer sings a sweet song."" "Welcome to FOTMD, Burke. It is good to have you aboard. Ken "The dulcimer sings a sweet song."" "Welcome to FOTMD, Chip77. It is good to have you aboard. Ken "The dulcimer sings a sweet song."" "Welcome to FOTMD, Nebraskahall. It is good to have you aboard. Ken "The dulcimer sings a sweet song."" "Welcome to FOTMD, Petec. It is good to have you aboard. Ken "The dulcimer sings a sweet song."" "Once the fret is pulled using John's instruction, you will want to fill it so that it just isn't an empty slot on the fret board. There are few ways to do..."
"Welcome to FOTMD, JackLarwa. It is good to have you aboard. Ken "The dulcimer sings a sweet song."" "Very nice instrument, Jack. Thanks for sharing it with us. Ken "The dulcimer sings a sweet song."" "You're welcome. Ken "The dulcimer sings a sweet song."" "Welcome to FOTMD, GeorgiaK. It is good to have you aboard. Ken "The dulcimer sings a sweet song."" "Welcome to FOTMD, Dtim54. It is good to have you aboard. Ken "The dulcimer sings a sweet song."" "Welcome to FOTMD, Chiselerwood. It is good to have you aboard. Ken "The dulcimer sings a sweet song."" "I have retrofitted a couple of dulcimers with these tuners from McSpadden. They have worked well. I broke on installing it it (my fault) and McSpadden..."
"Welcome to FOTMD, Kaden Wiginton. It is good to have you aboard. Ken "The dulcimer sings a sweet song."" "Welcome to FOTMD, Easel Roberts. It is good to have you aboard. Ken "The dulcimer sings a sweet song."" "Welcome to FOTMD, Tnfishdaddy. It is good to have you aboard. Ken "The dulcimer sings a sweet song."" "Welcome to FOTMD, Maylablue. It is good to have you aboard. Ken "The dulcimer sings a sweet song."" "Welcome to FOTMD, Philla. It is good to have you aboard. Ken "The dulcimer sings a sweet song."" "Welcome to FOTMD, SMuncy. It is good to have you aboard. Ken "The dulcimer sings a sweet song."" "Welcome to FOTMD, Dulcibob. It is good to have you aboard. Ken "The dulcimer sings a sweet song."" "Welcome to FOTMD, Harmonybc. It is good to have you aboard. Ken "The dulcimer sings a sweet song."" "Welcome to FOTMD, Miljo57. It is good to have you aboard. Ken "The dulcimer sings a sweet song."" "Welcome to FOTMD, Bonnetgirl. It is good to have you aboard. Ken "The dulcimer sings a sweet song."" "Rob, I tried emailing you, but I must not have a good email address for you. If you get this message, I will be at Wartz on Saturday. We talked about you..."
"I will Dusty. Looking forward to the book. Ken "The dulcimer sings a sweet song."" "I enjoyed the video Dusty. I'm sure I will enjoy the book as well. When our first grandson was born we gave him a CD of lullabies recorded by members of the..."
"Welcome to FOTMD, Janet. It is good to have you aboard. Ken "The dulcimer sings a sweet song."" "Welcome to FOTMD, Few It is good to have you aboard. Ken "The dulcimer sings a sweet song."" This is just a notice that it is available for pre-ordering on Amazon. Thank you! I'm very happy to be here. Thank you, Ken. I appreciate it; it's nice to be here! No I haven’t gotten my dulcimer yet it’s being special built for me. But I did see the Lancaster festival coming up this year and plan to attend. Thank you for the warm Hello. I’m in the Lancaster area. Still waiting for my mt dulcimer to be built and anxious to learn all. Thanks, Ken. I'm excited to get started on FOTMD. Thanks Ken. I'm enjoying the site. Thanks so much. And yes, the dulcimer does sing a sweet song. I'm hoping it will eventually when I play it! LOL! Thanks. I'm looking forward to learning! Thank you, Ken. It's nice to be here! Thank you! Looks like you are a builder?